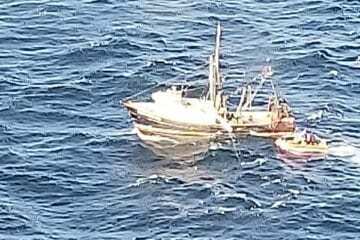 The Coast Guard assisted three mariners aboard a trawler based in Swan Quarter on Monday after their ship began taking on water more than 50 miles off Cape May, New Jersey. Watchstanders in Portsmouth, Virginia, received an Emergency Position Indicating Radio Beacon alert from the 77-foot fishing trawler Capt Garland, but were unable to make contact with the crew after hailing them on VHF radio channel 16, the Coast Guard said in a news release. Watchstanders diverted the Coast Guard Cutter Lawrence Lawson to respond and assist the crew using the coordinates provided by the EPIRB. When the crew arrived on-scene and made radio contact, the crew of the Capt Garland reported the vessel had taken on approximately three feet of water. A rescue and response team from the Lawrence Lawson used two P-6 dewatering pumps to assist via small boat. Once the Coast Guard crew dewatered the vessel and assisted in determining the source of flooding, they escorted the Capt Garland to Cape May, where the crew anchored at midnight and moored safely Tuesday morning. No injuries or pollution was reported. Great work by the CG . They saved this boat and crew for sure!